The Dillin “MAXI” is one of our four “standard footprint” ROE-LIFT Accumulators. Its time tested and patented design provide a reliable high-speed and high-volume accumulation solution. By standardizing the length and width and building to your height and accumulation requirements, we are able to offer the MAXI at a substantial cost savings over other accumulation methods. This MEGA Accumulator can be integrated with Dillin’s: Product Handling Conveyors, Merge/Divert Stations, and/or Incline/Decline Conveyors. RWave® Transfer available on all MEGAs allowing two or more rows of product to be accumulated on every lift rail. Open access from operator side and visibility of accumulated product from all sides. Dramatically improves Line efficiencies when the process end is adversely affected by down time due to downstream equipment stoppage. Provides completely automatic accumulation during downstream machinery downtime allowing process end to continue operating. 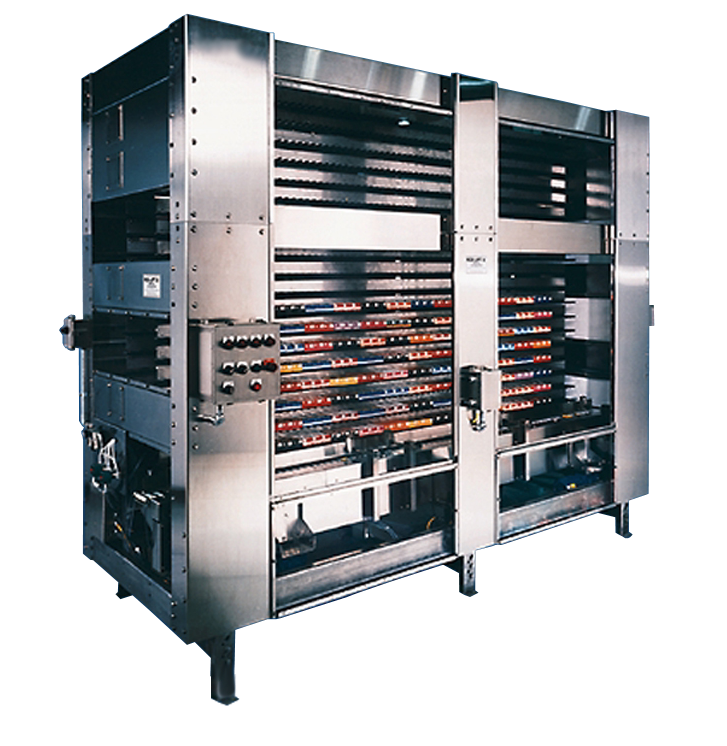 Provides completely automatic De-accumulation when downstream machinery comes back on line without interrupting production flow.